The Garden Plot: GMG's Friday Find - Giving Children Roots to Grow! GMG's Friday Find - Giving Children Roots to Grow! Today's Friday Find is all about bringing the love of gardening to children. You have enjoyed gardening for years and now want to share that hobby with your children or grandchildren. What better way to show them how much fun it is by helping them really see what is happening beneath the ground! Feed children's natural curiosity with HSP Nature Toys award-winning nature kits! The Root-Vue Farm won the Dr. Toy Best 100 Toys Award, the Parent's Choice Seal of Approval, and the Oppenheim Gold Seal. 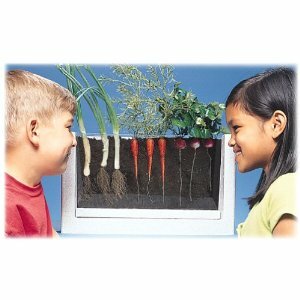 Give kids X-ray eyes while they watch carrot, radish and onion seeds develop underground! 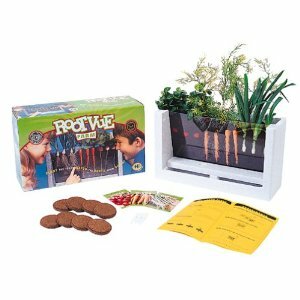 This self-watering grow unit has a special viewing window set at a proper angle which makes it easy to watch the roots develop underground! Watch carrot, radish and onion seeds grow up as the roots grow down! Fun for ages 4 and up. Made in the USA. Full Safety Approval. Complete kit includes: Durable unit with acrylic viewing window, built-in water basin and drainage reservoir, light shield that keeps plants growing but can be removed for viewing roots, 8 super-expanding grow mix wafers, 3 packets of seeds, identification labels, water wicks for self-watering system and 16 page booklet with complete instructions and experiments. $32.95 (free shipping!) Measures 16" x 5.57" x 9.57". I may get one of these for myself! How cool! Love this. We've talked about using an ant farm to showcase root structure for years. Gardening finally goes underground. Why are you spamming my email account. Blacklisting this crap everywhere I can.